Featured on this page are two wrist calculators, the Sinclair Wrist Calculator and the Quik-Check. Wrist calculators are pure calculators for strapping to the wrist and should not be confused with calculator-watches which are combined watches and calculators. 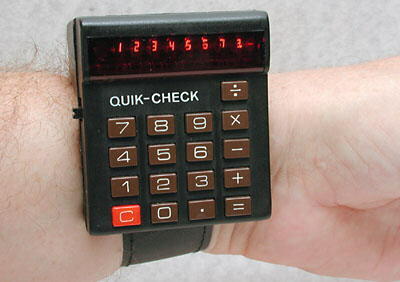 In calculator development the wrist calculator was a dead-end. It probably seemed a good idea in the mid-1970s when semiconductor manufacture had developed to the point at which a true "calculator-on-a-chip" could be produced, additionally requiring only keyboard, display, battery, and case to produce a calculator. Although everything was squeezed into a very small space, these wrist calculators are still rather large and chunky devices when strapped to the wrist. They were soon overtaken by the rapid development and drop in prices of calculator watches, such as the Pulsar and the Compuchron models, which combined a calculator and a watch in a much smaller and more elegant casing. Also, credit-card sized calculators were just being introduced, such as the Casio Mini Card LC-78, which could be carried in a pocket while taking up negligible space. Here are details of the only two known models of wrist calculator, the Sinclair Wrist Calculator and the Quik-Check. Size: 47 x 45 x 18 mm (1.9 x 1.75 x 0.7 ins). Made in England by Sinclair Instruments Ltd. (a company formed by Clive Sinclair as Sinclair Radionics started to have financial difficulties, later becoming Science of Cambridge Ltd.). 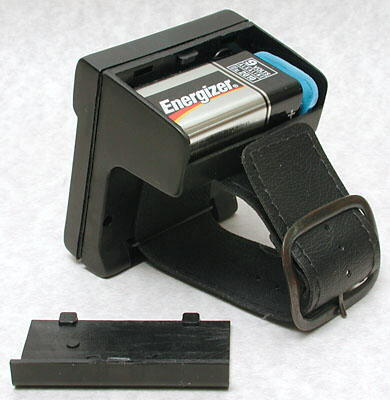 Was available only as a self-assembly kit, by mail order from Science of Cambridge, previously Sinclair Instrument Ltd. There are two versions of this calculator, see photograph of the later version below. Total price was £11 GBP (about US$20). Clive Sinclair was always interested in making tiny versions of common electronic items. Here, into the smallest practical volume he managed to squeeze the LED display and chip used in other Sinclair calculators (the Sinclair Cambridge Memory and Cambridge Universal), which were then becoming obsolescent. Second version of the wrist calculator, advertised in November 1977 as "Now even better, even more powerful"
Note the extra functions below the keys as well as above, and the function switch on the keyboard, rather than out of sight on the lower edge of the body. Wrist calculator and assembly instructions. Wrist calculator main components showing the Mostek MK50321N integrated circuit. Integrated circuit - Texas Instruments TMS0972NL, here date coded mid-1978. Size: 57 x 63 x 42 mm (1.25 x 2.5 x 1.7 ins). The manufacturer of this calculator is not known. If you have any additional information please get in touch with us. 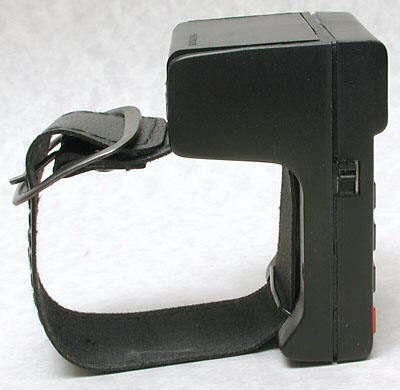 Side view of the Quick-Check showing the unusual shape, with the bulge at the back to hold the battery. The shape is suitable for fitting round the wrist. View from the back showing a 9v PP3 battery installed. Adamson, I., and Kennedy, R., (1996) "Sinclair and the 'Sunrise' Technology", Harmondsworth, Penguin Books Ltd., ISBN 0-14-008774-5.